Wonderous adventures in the surreal city. I believe I first really heard about Itras By (Itra’s City) back in 2010, when Niels Ladefoged Rasmussen and Anne Vinkel (of recent The Good Roleplayer Must Die fame) wrote a scenario for Fastaval called The Boy and the City, which was set in Itras By. Also, I know one of the authors, Ole Peder, so I was curious to look at the game he’s made. Itras By is inspired by the surrealism movement of the early 20th century. It takes place in Itras City, a wondrous place of (literally) bull headed people, vanishing streets and anarchists smoking cigars made from flakes of the sky. It’s a city of beauty and humour, but also of strife and tragedy. The game presents you with a very open frame for creating your characters. You can be anything or anyone you want, from a beggar in the street to something akin to a god. Before you create your characters, though, the game tells you to talk with the group and come up with a concept for the characters, and for the campaigns. Are you a club of revolutionaries, the crew of a ship embarking upon a voyage, maybe bored rich youths out for adventure – or just a group of neighbours living in the same house? Each character is made up, first, of a concept. This is similar to many other games, but even more important, as the rules place so few limitations on your character. You will then write a background, “dramatic qualities” (aspects that you will be able to bring to bear in dramatically loaded situations) “intrigue magnets” (that the GM will use to create plots you are interested in) and supporting characters connected to your character. Resolution is done by drawing from a special deck of cards, giving results such as: “Yes, but… The character succeeds, but there’s a tiny detail that doesn’t go quite as planned.” Or: “No, but… The character fails, but another positive thing happens instead, unrelated to what she was aiming for.” It is then up to the GM and the players to interpret the card in the situation. The game starts off with a long setting chapter, and finishes with several sample scenarios and sample campaigns, to give you a feel for how the game works. The prose of the book is very literary, quite poetic and a tad dreamy. The whole book is liberally sprinkled with some nice drawings of some of the weird creatures and places in the book. 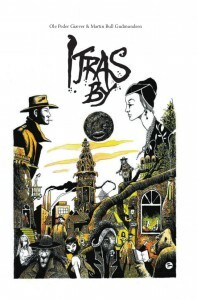 My impression: The book of Itras By is a beautiful thing to behold. I’d almost wish I had a physical copy, just to be able to take it out and look at. It could almost serve as a coffee table book. The art style is very appealing, and helps underline the feeling of the book exceedingly well. Meanwhile, the layout of the book is pleasing, and also supports the mood of the book. The setting, meanwhile, is equally wonderful. I am the kind of person who has bought many a role-playing book, not with any intention to ever use it for play, but simply to read the descriptions of the setting. The setting of Itras By is like that. Each section is wonderful, and filled with great ideas and inspiration. I would love to delve further into the setting. Which brings me to the weak point of the book: the part where you actually sit down to play with the game. This whole part seems very vague, and doesn’t really give the reader the tools to create a good game of Itras By. To be fair, this is probably at least in part because they want to give the players as much freedom as possible to create the game they want in the setting. On the other hand, when the game tells me to come up with a concept for a character, it gives me just one short paragraph to do this. Now, in a game like Vampire, that would be fine – the game has already given me several constraints to work within, like the clans of the game and the city the game is set in. But in Itras By, anything goes. That means that a lot more work goes into figuring out who and what you want to be. This doesn’t just go for character concepts – creating a campaign concept is left very vague as well. The problems continue when we get into Dramatic Qualities. These are the only “crunchy,” mechanical bits of your character. But the game gives very little direction as to what you’re going for here. Anything can be a Dramatic Quality – or not, depending. Depending on what? On what you feel like! Well, how many do I get? Oh, as many as you like, but between one and four is a good number. And then, once we have our characters and get into the actual play portion of the game, the vagueness continues. The whole chapter on playing the game is mostly filled with general roleplaying advice, like how to get into character and not to try to prevent interesting things from happening to your character. All of it is great advice, and I might well give those pages to anyone playing any kind of roleplaying game – not least traditional games like Vampire or Unknown Armies. But it doesn’t really tell me how playing Itras By is different from any of those other games. The game does put a lot of emphasis on improvisation, which is not commonly found in other traditional games. On the other hand, it’s still not really something special about Itras By. The resolution mechanic is probably the most innovative thing about Itras By, in all its simplicity. The resolution cards are simple and easy to use, but it seems like they give a lot of fodder to the story. It’s a really clever way of introducing very nuanced input to the story, without just going into different degrees of success. A “Yes, and…” result is radically different from a “Yes, but…”, and gives the players and GM some good cues for how to adapt it to the story. It also focuses on the story-based, improvisational nature of the game. The game also comes with some “Chance Cards,” allowing you to introduce some randomness into the game. These look interesting, though I’m a little worried they might not always be beneficial to the game. I’d have to see them in play to pass judgement – it’s certainly an interesting concept, and if the group can handle them, I think it could be a great boon for a game. From the above you might conclude that I dislike Itras By. That is not the case. I’m intrigued by the game, and I can see the possibilities for some great games in this city, using these rules. But I would have liked some more guidance for both the players and the GM, to ease them into the world of surrealistic roleplaying. As it is, I would love to play this game with players who have played a good number of Story Games and Indie rpgs before, people I know will be able to spin good stories within the loose framework of the game. On the other hand, I would not give this book to players who are not used to communal storytelling – that might well lead to disaster. How would I use this: I would love to play a short campaign of a few sessions of this. I think this game would be very well suited to campaigns of a limited span, exploring one main storyline. On the other hand, I don’t think I would want to do a campaign with no agreed end-point – I don’t think the structure would hold up to long-term play.